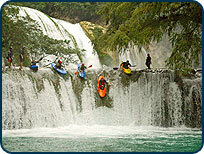 The River Gypsies: kayak instruction, creek boating clinics, creeking clinics, whitewater instruction. 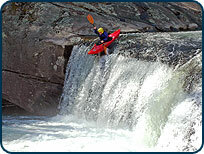 Since 2005, Leland and Andria have been providing high quality kayaking instruction and adventure travel to paddlers from across the world. Our many years of experience as professional guides combined with our easy going style allow for a great learning atmosphere where you can progress at a comfortable pace. We've taught clinics from the Southeast US to the Mid Atlantic and Pacific Northwest, and our adventure travel trips have explored locations in Mexico and South America. Known as the original teachers of creek boating clinics, we also offer a full range of private kayak instruction from beginner to expert.